The Kernel_Security_Check_Failure error occurs when the driver you are using is not compatible with the installed version of windows. It can also occur for various reasons like memory problem, virus infection, faulty device driver and many more. 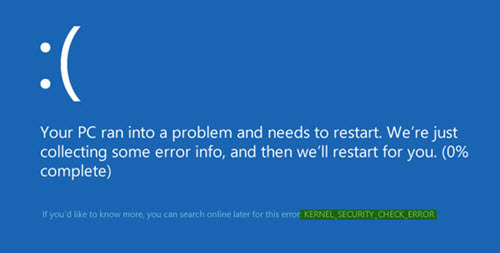 There are 2 possibilities to this issue, either you can log into your Windows 8.1 or Windows 10 PC and once in a while you get the “Kernel Security Check failure” Blue Screen of Death, or you just cannot log in to your operating system and your device presents you this error message whenever you power it up. Among the cause of this BSoD could be the current modifications you made to your system. Try eliminating the recent hardware or software you just recently added to your system and after doing that check for Kernel_Security_Check_Failure error. If your Windows 10 fails to start correctly, go to Settings, select Advanced Startup open the ‘See advanced repair options’ menu. In the new window, left click on Troubleshoot. 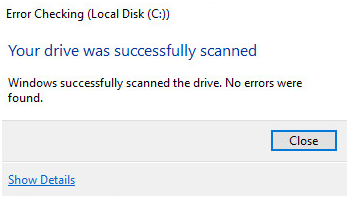 After scanning process completes, type ‘Exit’ to close the Command Prompt window and hit Enter. In the search box, type memory and select Windows Memory Diagnostic. Run as administrator and select ‘Restart now and check for problems’. Open Run window by pressing Windows + R.
Type devmgmt.msc in the Run Window and hit Enter. The Device Manager window will open where you will see a list of hardware associated with your system. Expand it. Now look for a yellow triangle with an exclamation mark against any device driver. If you find any such driver, right click on it. Then click on Update. On your keyboard, press the Windows key and E at the same time. Click This PC. Right-click the hard drive that you want to check and click Properties. Go to the Tools tab and click Check option. Restart your computer and insert a Windows 10 bootable media into the optical media drive. On the displayed Windows Setup box, click Next and then click Repair your computer. On the ‘Choose an option’ screen, click Troubleshoot. Click on Advanced options and after that select Command Prompt.